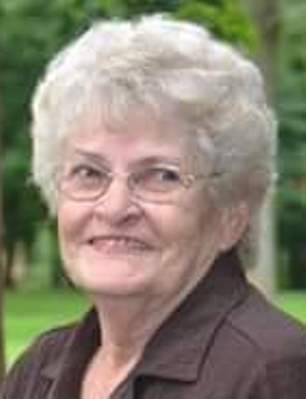 Bonnie L. Widman, 77, of Fremont, OH passed away at home surrounded by her family on Tuesday, December 04, 2018. She was born on August 5, 1941 in Penfield, OH, the daughter of Julius and Virginia (Caroniti) Wargo. Bonnie married Cyril “Cy” Widman on June 26, 1965 at St. Joseph Catholic Church in Fremont and he preceded her in death on October 7, 2006. Bonnie was part owner of The Donut Stop for four years with her husband Cy. She was also owner of Java Jockey-trucks supplying food and drinks to factories. Bonnie and Cy owned and operated “Bonnie & Cy’s” restaurant in Fremont for thirty-six years. She enjoyed farming with her father, playing cards, baking, fishing, crocheting and spending time with her family and grandchildren. Bonnie was a member of St. Joseph Catholic Church, AA and the Fremont Moose. Bonnie is survived by her children, Vickie (Tim) Biggs, Fremont, OH, Jeanette Wilson, Marlinton, WV, Diane (Kelvin) Haynes, Wellington, OH, Rick Wilson, Collins, OH, Stephen Widman, Ninette Widman and Patricia “Patty” (Bob) Carnicom, all of Fremont, OH; mother, Virginia Wargo, New London, OH; sisters, Betty (William) Camp, Jacksonville, FL, Barbara (Steve) Bowerize, Toledo, OH, Marcia (Kevin) Ledet, Greenwich, OH and Karen Thacker, Elyria, OH; thirteen grandchildren; ten great grandchildren and special companion, Joe Kramer, Fremont, OH. She was preceded in death by her father; husband, Cyril “Cy” Widman and sister, Margaret “Peggi” Ann Merril. Services will follow visitation at 5:30 p.m. at the funeral home. Memorials can be made to the Fremont Food Pantry, Sandusky County Humane Society, Heartland Hospice or Another Chance Sanctuary. Amazing woman…I will miss her…love hugs and prayers …. My deepest sympathy for the loss of this special lady. Thoughts and prayers for all her loved ones at this difficult time. So sorry for your lost Nin. Sorry for your loss Nin. To all the Widman family, I am very sorry for your loss. I remember many dinners with my parents at Bonnie & Cy’s. Bonnie was a special person. My condolences to all the Widman family, as you well know she will be missed deeply. One of my fondest memory of Bonnie was when we all would be swimming and she would bring us a snack and drink, then sit and enjoy everyone splashing and playing. She was a wonderful mom, wife and friend, may she rest in peace. our sencire condolences to the Wilson/Widman family ! May Bonnie rest easy in Heavin ! We send our deepest condolences to Nin, Steve & the entire family. Bonnie was a wonderful person who always had a kind word for me. The years of breakfast on Sunday with my family at Bonnie & Cy’s is and will always be enduring to my soul. Just as Bonnie will be enduring to this family. Your family is in our hearts and prayers. My condolence to Vickie and family,my thoughts and prayers are with you. Condolences to the family. Bonnie and I were friends when I lived in Fremont so sad to hear of her passing. Prayers of comfort for the family. So many memories of eating and chatting with Bonnie at their restaurant. We just loved her perspective and kind heart not to mention wonderful camaraderie and good food. So sorry to hear about your mother we always enjoyed being around her & talking to her she was blessed to have a wonderful family that loves her so much! me, and has always been there for all of us. Rest in peace my dear friend.. Growing up, my family was neighbors with Wargo’s on Route 13. There were many times at picnics, etc. that we shared with Bonnie and her kids. You have our sympathy, Larry & Carolyn (Marett) Burson.